Hi Crafters! The last sample is done for our November 2016 Stamp-a-Stack. Dates/times are: Thursday November 17 from 10 AM to 9 PM and Saturday November 19 from 9 AM to 4 PM. HOWEVER, if Friday is the only day you can come, anytime after 3 PM until 9PM is fine. If you need to come earlier on Friday, please let me know and I should be able to accommodate you. I have a very small group of seniors coming from 10 AM to 3 PM, most of whom are not stampers, so my concentration will be with these 4-5 women. However, if you can work independently, Friday during the day will be fine. The cost for November Stamp-a-Stack is $18 for 9 cards. This is a bit more expensive than Christmas in July due to the use of glimmer paper and metal foils. The sooner you can let me know if you are coming and what 9 cards you choose to do, the more I can do to help you by die cutting the images. There is very little stamping, a tiny bit of gold embossing that I can pre-do for you, and NO BOWS!!!!! 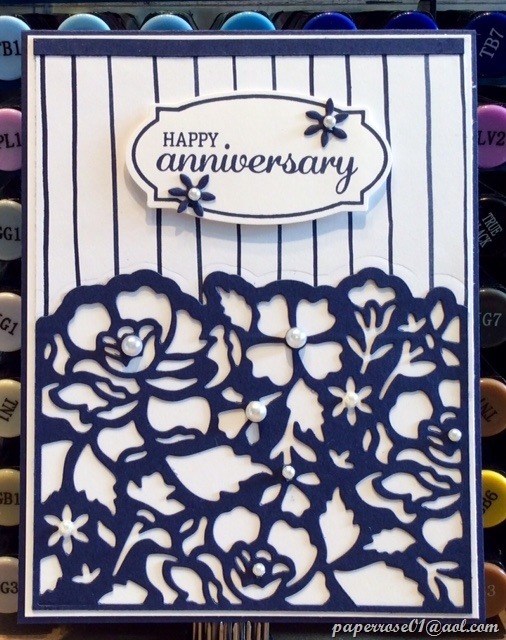 There will be directions and after the die cutting and stamping is complete, your cards can be finished at home. Greetings from Santa is a very cute card and surprisingly easy to make. 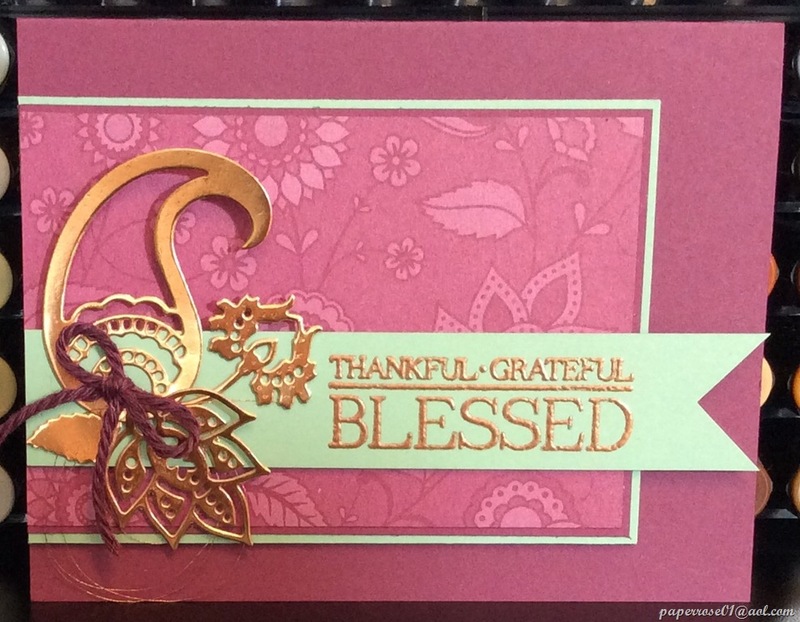 I discovered that using parchment paper to assist in intricate die cuts works beautifully. There is no waxy residue left as you find when using wax paper, and the die almost falls out. I do encourage using the precision base plate, and I use the foam pad and rolling brush to remove the small pieces. 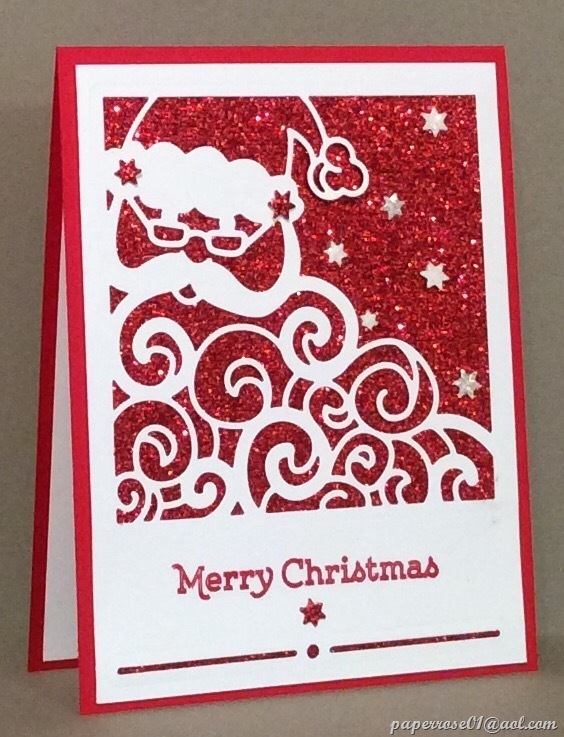 Santa’s face is layered on red glimmer paper and I added a few sparkly stars. 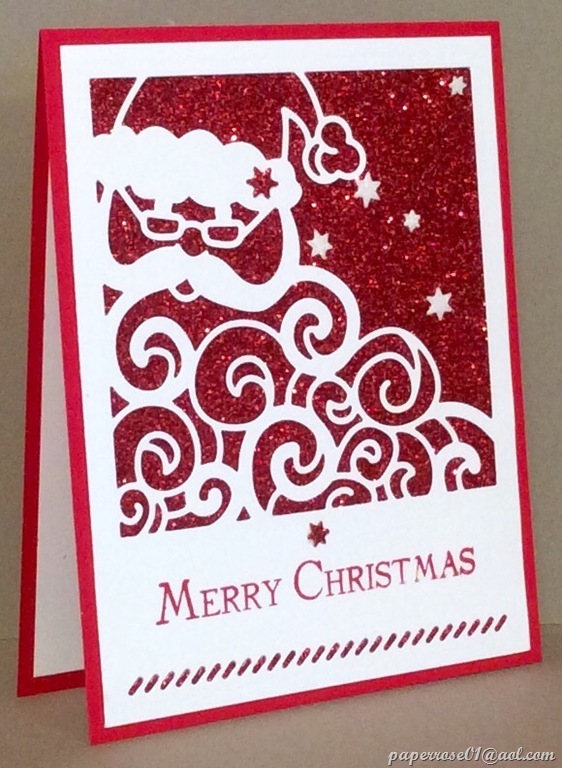 A small piece of red glimmer paper is glued over the decorative die cut at the bottom of the face layer which allows the sparkle to flow from top to bottom. 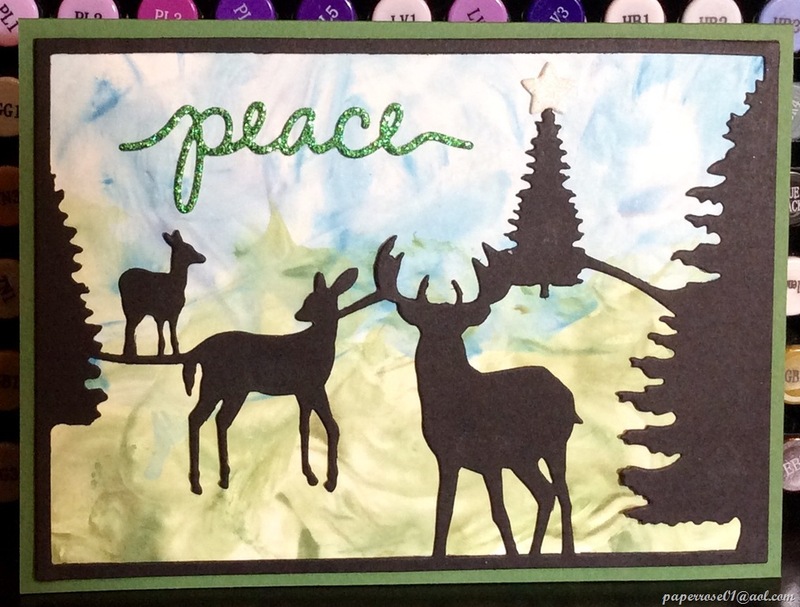 I found this holiday message in my archives and like how it works with the card. 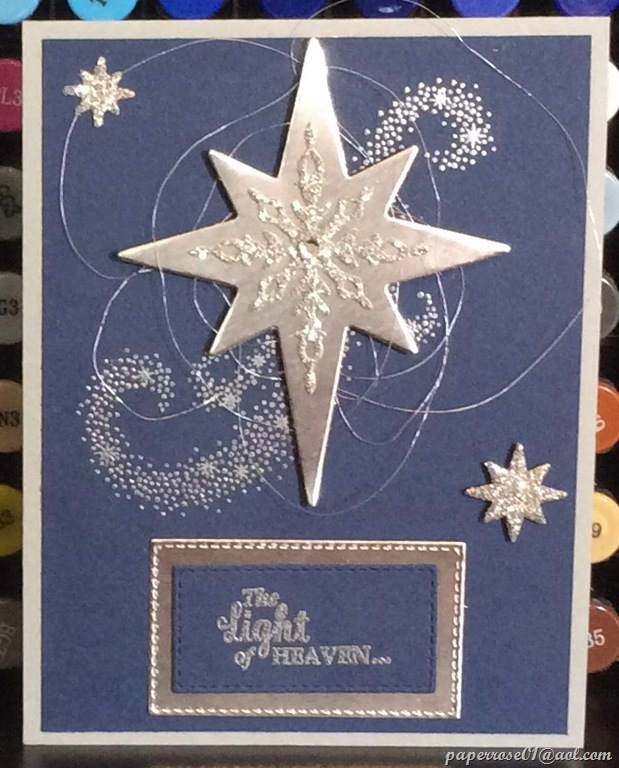 A stamped tree and glimmer star help carry the theme of the card throughout. This Greetings from Santa is like the one above except for the decorative die cut at the bottom of the face layer. 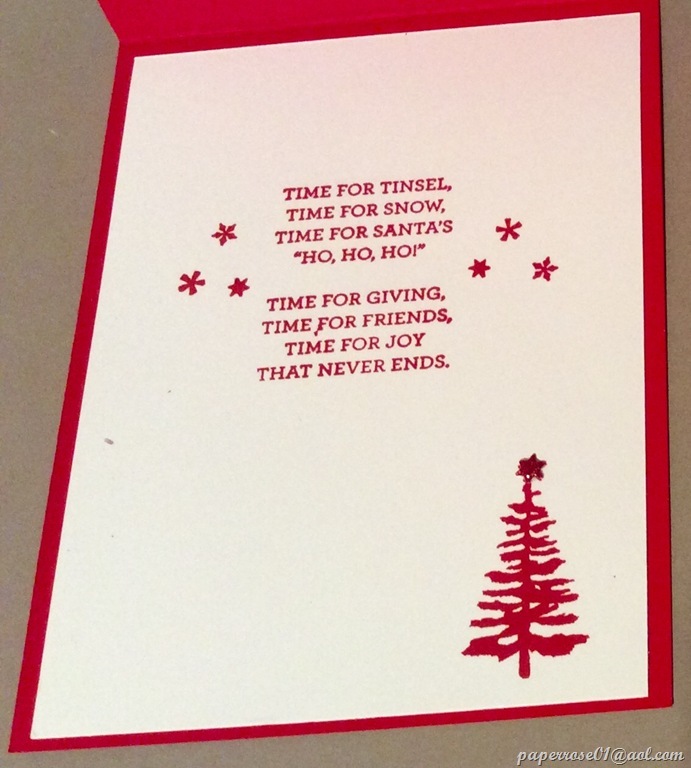 If you choose to do the Greetings from Santa card, please let me know which decorative die cut you prefer. 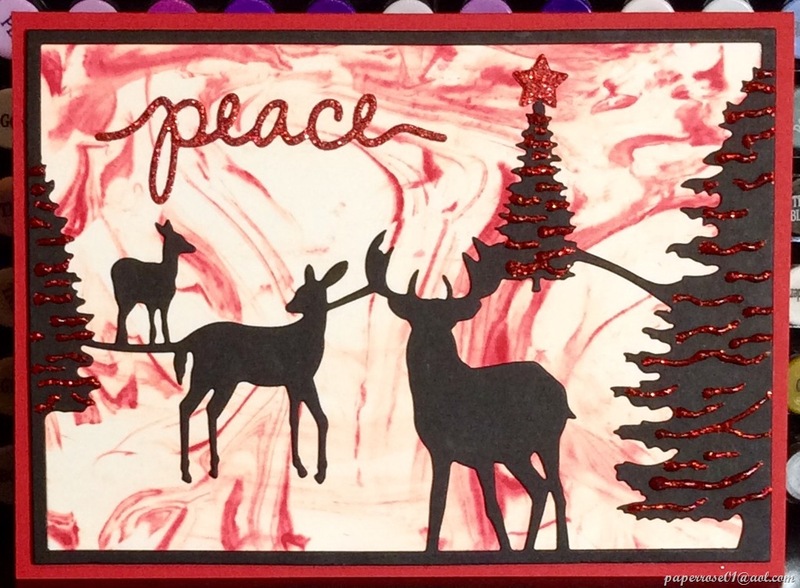 This basic red and white card is perfect for anyone at Christmas. Santa’s Sleigh is a bit more artistic. 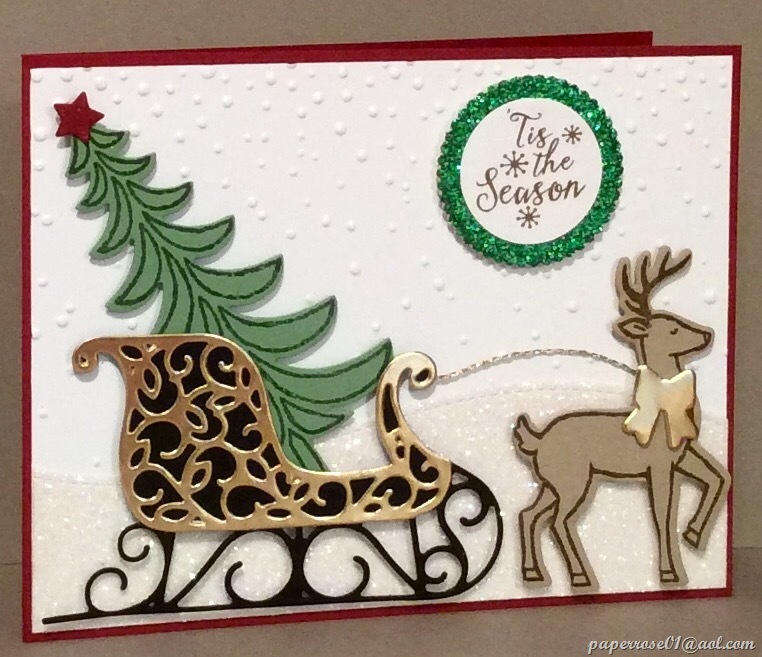 This card features a deer pulling a sleigh burdened with a big Christmas tree as snow falls from above. This view uses gold metal foil filigree decorating a black sleigh. A gold cording rein keeps the Crumb Cake deer in line. The deer features a gold metal bow. This scene is popped up against a Dazzling Diamonds glimmer snow bank. .This Santa’s Sleigh features silver metal foil for the sled filigree and bow for the deer. This card would also be attractive done with copper metal foil. If you choose to make Santa’s Sleigh, make sure you specify which metal foil you prefer – gold, silver, or copper. Or maybe one of each! Joyful Nativity is our final card for November 2016 Stamp-a-Stack. The colors don’t show up well in this image. 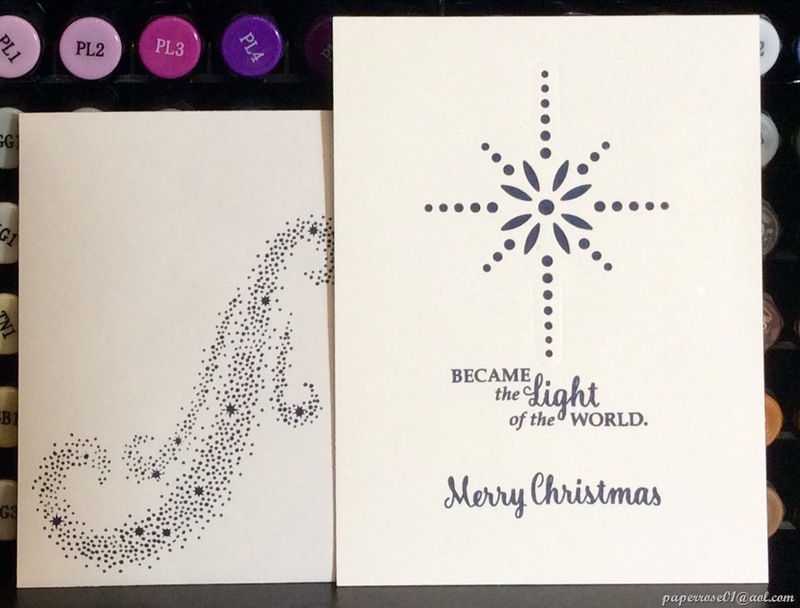 The Holy Family is embossed in gold within the black stamped JOY. This is layered on gold glimmer and then black card stock. The triple layer is popped up on Very Vanilla cs that has been embossed with the new Seaside Embossing Folder, A decorative gold glimmer border peeks out each side of the main layer. The actual card is Delightful Dijon. 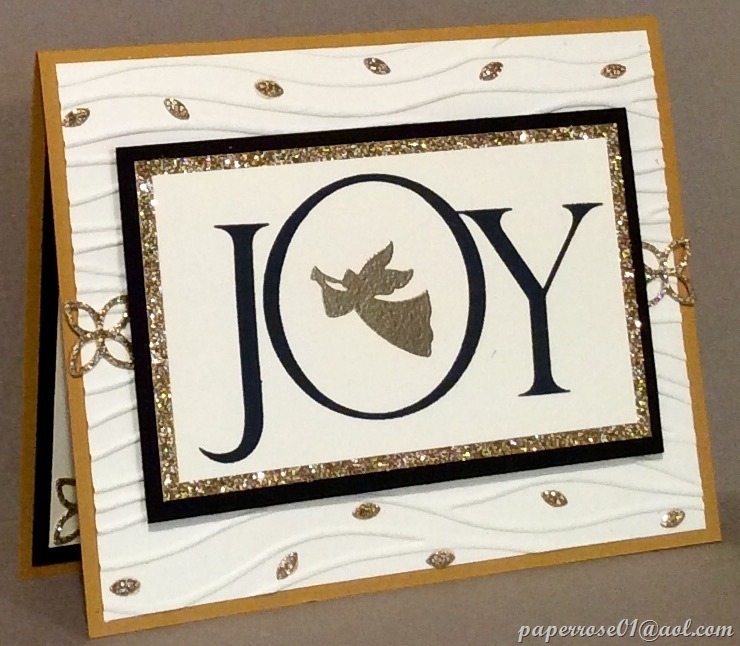 A second sample of Joyful Nativity features a gold embossed angel within the O of JOY. A few of the gold glimmer “leaves” that come from the decorative gold glimmer border have been added to accent the flowing embossed lines. Also attractive is using the debossed side of the embossed cs. 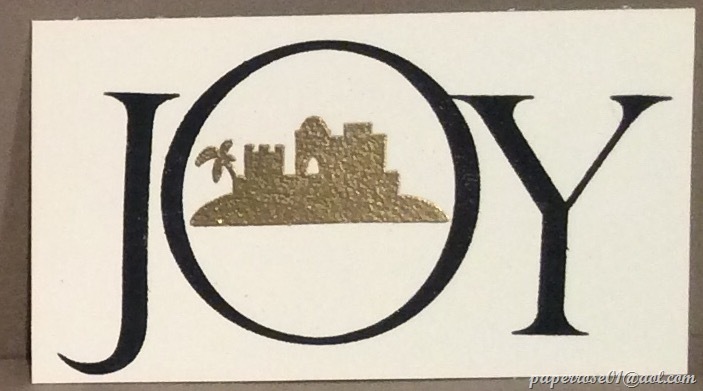 Joyful Nativity also has the city of Bethlehem stamp that can be gold embossed within the stamped JOY. If you choose to do this card, please specify what image you prefer – the Holy Family, the angel, or Bethlehem – or perhaps one of each. 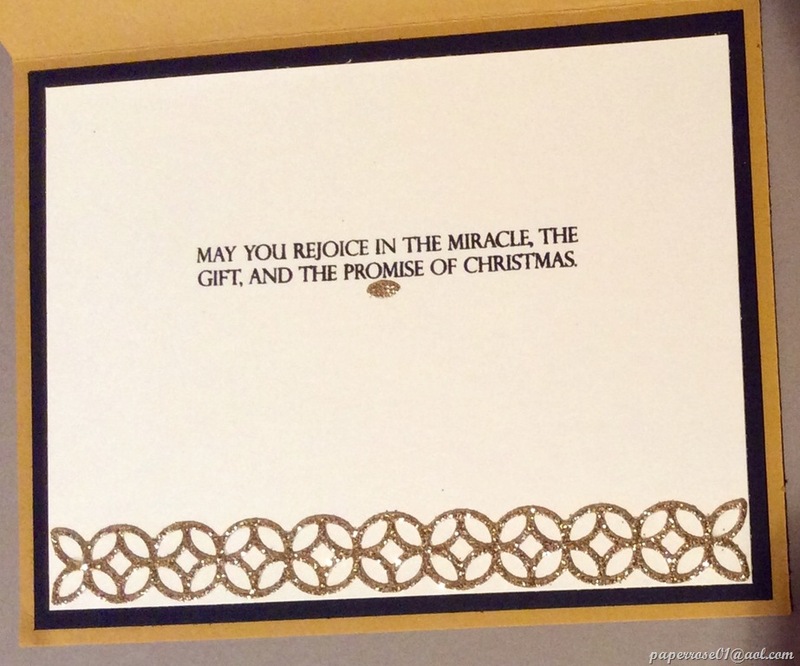 The message layer of Joyful Nativity carries through the gold glimmer theme with the addition of the gold border that is seen on the card front. 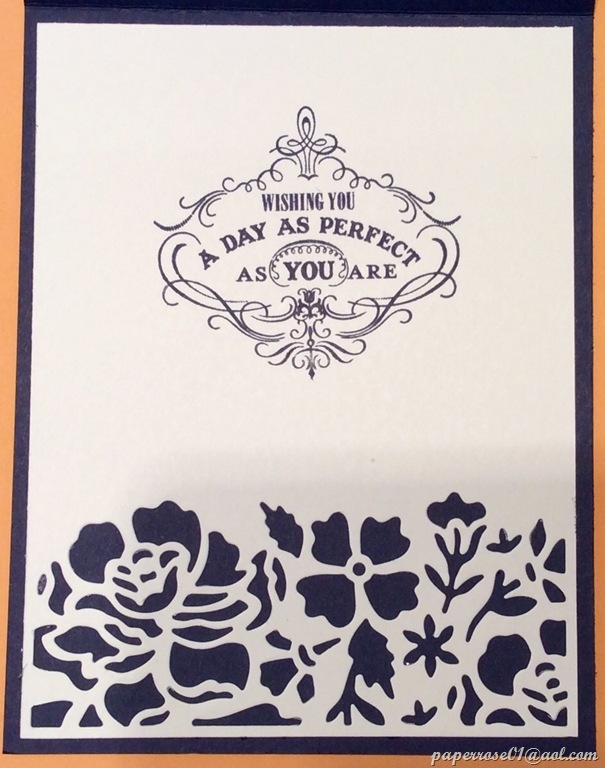 A simple black-stamped message is layered on black and then onto the Delightful Dijon card. To summarize November Stamp-a-Stack, there are 3 cards – Greetings from Santa available with 2 decorative die cuts – Santa’s Sleigh available with silver, gold, or copper metal foil accents – and Joyful Nativity available with the gold embossed Holy Family, angel, or city of Bethlehem. You can choose any 9 cards – all of 1, 3 of each, or any other combination. The dates and times are specified at the top of this post. The cost is $18 which includes all materials and supplies. What I need from you is: 1) Are you coming? 2) What day works best for you? 3) What cards do you wish to do? As soon as I have this information, I will start cutting the pieces for your cards to simplify your card-making. 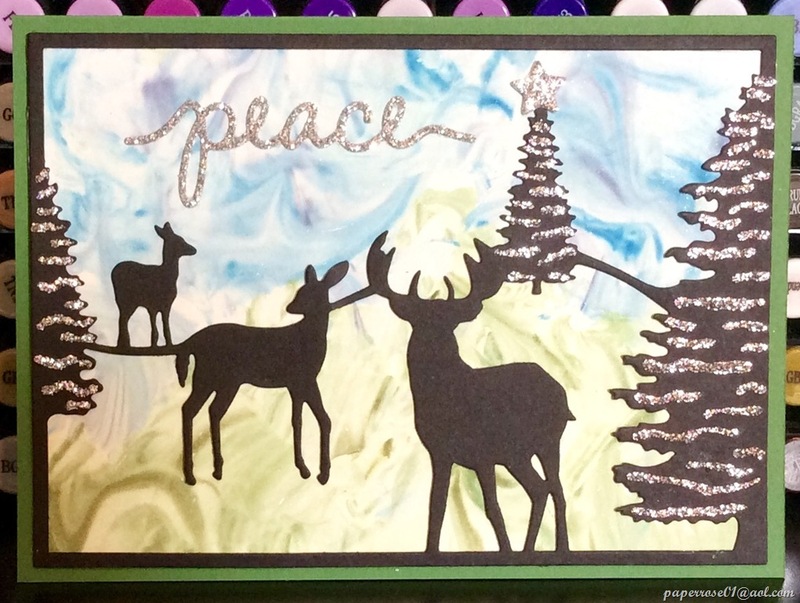 The end result is 9 gorgeous cards to share with your friends and relatives. These cards are created with the hands but come from the heart. What would you rather do – can fruit or arrange flowers??? For our jar cards, we use the Jar of Love stamp set and Everyday Jars framelits dies. The jars you see here are actually 3 parts. The base is the jar stamped on Whisper White cs, painted with a pale wash of Watermelon Wonder or Peekaboo Peach, and die cut. 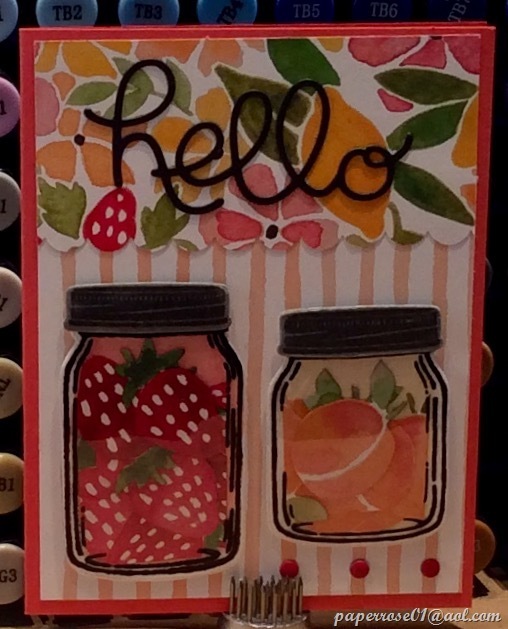 The jar is then filled with strawberries or peaches fussy cut from the Fruit Stand Designer Series Paper. The jar is then stamped with Jet Black StazOn on a window sheet, die cut, and glued over the filled jar. Finally the lid, stamped in Basic Gray on Smoky slate is wet embossed with clear embossing powder, die cut and adhered onto the jar. The jar bases have been pre-stamped, pre-painted, and pre-cut for you. The window sheet jars have also been stamped and pre-cut for you. I found stamping the jars on the window sheeting to be quite challenging as the photopolymer stamps wanted to slide on the window sheets. However, I finally came up with enough for stamp camp. If you prefer flower arranging to canning fruit, this is the card for you! The base of the jar has been painted with a very light wash of Marina Mist. Stems of leaves and flowers are placed in the jar and the window sheet jar is glued on top. I added several stems to the jar to increase the fullness. Small stamped and die cut flowers were added to the flower stems and greenery. 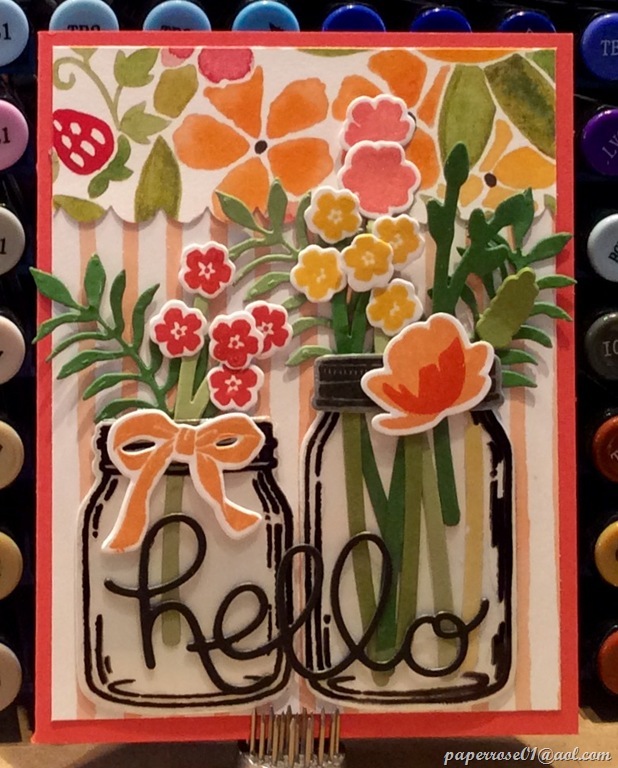 I added a jar lid on one of the jars before I realized – DUH – how can you have a lid on a jar filled with flowers. But I liked the finished look and chose to leave it. The smaller jar was filled with a smaller amount of flowers and foliage and a bow was added to the jar rim. Part of the challenge with this card is that I spent many years as a floral designer and even taught college level floral design. Consequently, I still hold the same design principles and it is hard to let them go for this card! 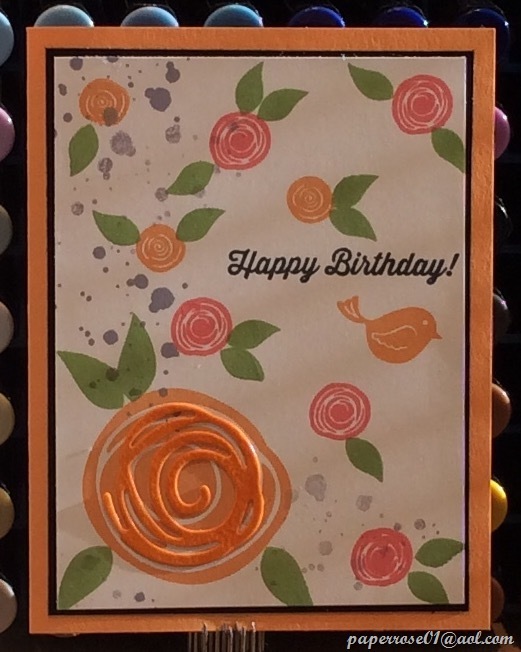 Both cards use the Fruit Stand Designer Series paper for the background. 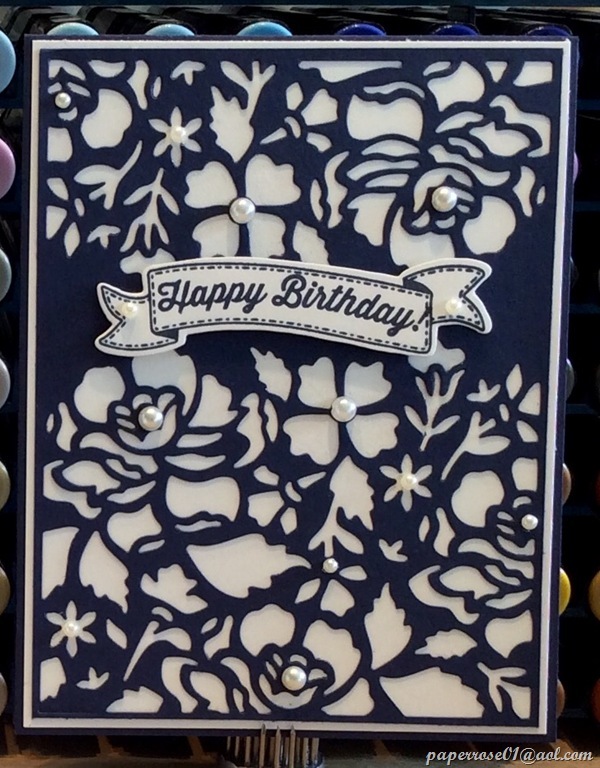 The top scalloped DSP on the floral card is shorter than the fruit card. The placement of the black “hello” sentiment varies, depending on which card is chosen. An interesting combination would be one jar filled with fruit and the other with flowers – a fruit and flowers combination! Or you could even fill your jars with fish which are included in the stamp set and matching framelits. This is our final card for September Stamp Camp. I hope you can make it. Remember to let me know which 4 cards you choose to do, or I will assume you wish to do 1 of each. If you know you wish to do the fruit jar, it would be helpful to let me know so I have a sufficient number of jars with Watermelon Wonder and Peekaboo Peach washes. As a reminder for dates and times – Thursday September 1 from 12N to 4 PM, Friday September 2 from 2 PM – 9 PM, and Saturday September 3 from 9 AM – 4 PM. October Stamp Camp will be October 6, 7, and 8. 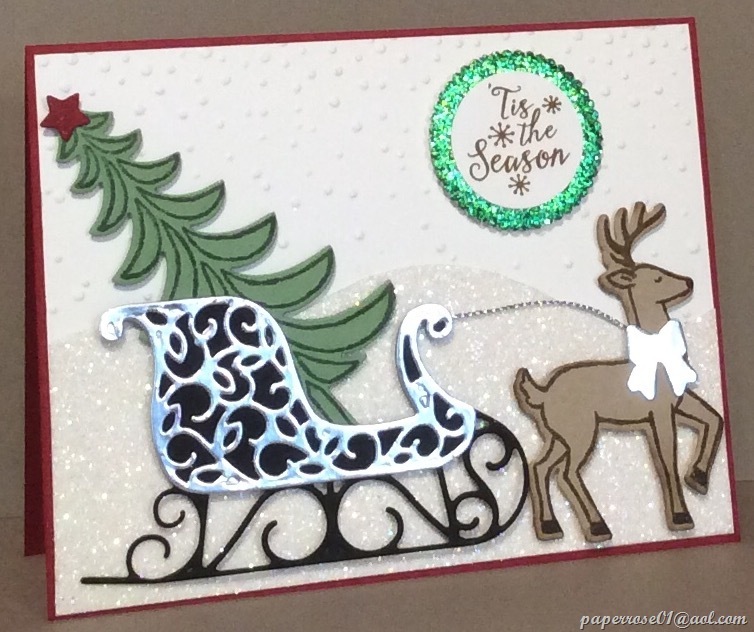 We will be doing a shaving cream card in October as well as a Cookie Cutter Christmas card. 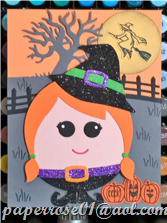 The Taylored Expressions Roly Poly Witch will also make her debut at October stamp camp. A fun time is guaranteed. Don’t forget about the September 20% discount for all Stampin ’Up products. This is a discount offered by me – not Stampin’ Up so orders will need to filter through me! 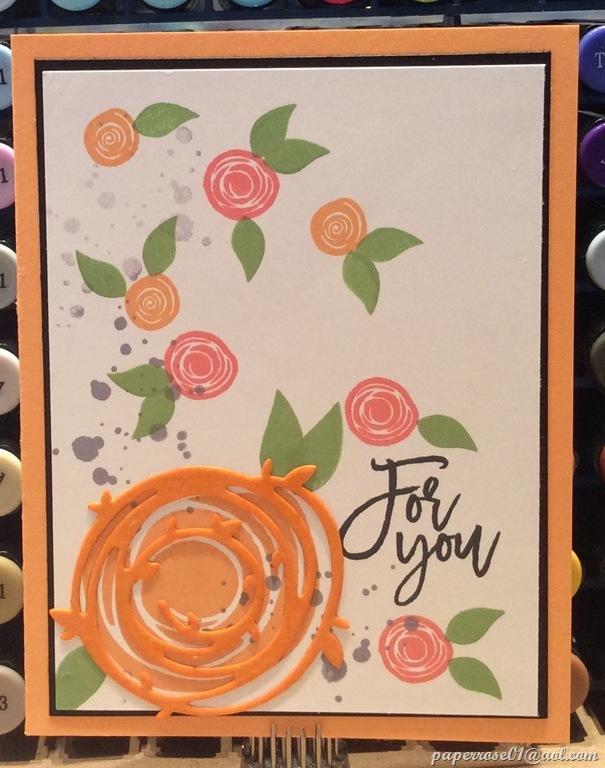 I thought an easy peasy card would be nice for September Stamp Camp and decided to use the Swirly Bird stamp set and the Swirly Scribbles matching thinlit dies. This is a fun card that you can’t go wrong with. 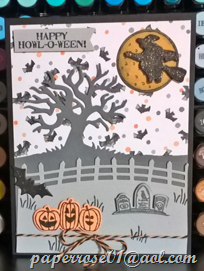 I started with the new Peekaboo Peach cs for the card, cut a 5 X 3 3/4 piece of Whisper White and layered it on Basic Black. Next I added some grunge in Wisteria Wonder and added my swirls in Flirty Flamingo and Peekaboo Peach. The leaves are stamped in Wild Wasabi. I die cut a swirl of peach, and heat embossed it with clear embossing powder. 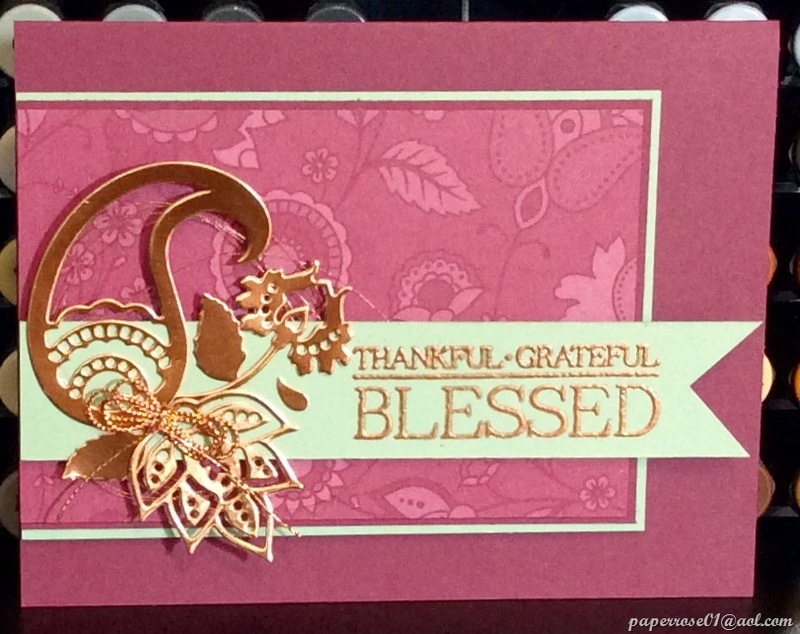 The glossy finishes adds texture and interest to the card. A simple sentiment in basic black finishes off the card. 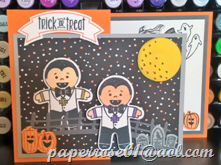 This card is cute, fun and most importantly – easy!!!! This second sample is very similar to the first but I chose to include a bird and changed the layout slightly. The peach swirl in the lower right hand corner is slightly smaller than the swirl shown in the first sample. You can choose to do your Swirls card however you wish! And wait until you see the inside – something quite different using one of the Swirly Scribbles dies. This set has lots of possibilities and can be used for masculine cards without the flowers. This is a set to keep your eyes on to see how different folks use it. I hope you can make it to September Stamp Camp. Remember that you can choose to do any 4 of the cards. If you don’t care for one, you can choose to do 2. 3 or 4 of another card. My goal is to offer an assortment of styles so you can choose the styles that meet your tastes. But PLEASE, let me know as soon as possible what 4 cards you prefer doing or I will “assume” you want to do 1 of each. I will be cutting paper later today. The Floral Boutique thinlit dies are a new favorite of mine. I chose not to purchase the bundle as I didn’t feel I would use the stamps that came with the bundle. The thinlits, however, are awesome and truly easy to work with. I use the Precision Base Plate and the Die Brush with these thinlits. The intricate pieces fall out very easily and no shim is needed. This is a 3-piece set and the card front you see here uses the 2 thinlit dies. The 3rd die is an edgelit and you use it to cut a neat separation for either of the thinlits. The next sample shows the use of the larger thinlit and the edgelit die. Using only 1 of the thinlits and layering it with a casual designer series paper, the card is much less formal than the view shown above. Assorted sized pearls were used on both views but I’m sure rhinestones would also be a pleasing embellishment. Being the hoarder that I am, I saved many of the little pieces that were die cut from the thinlits. 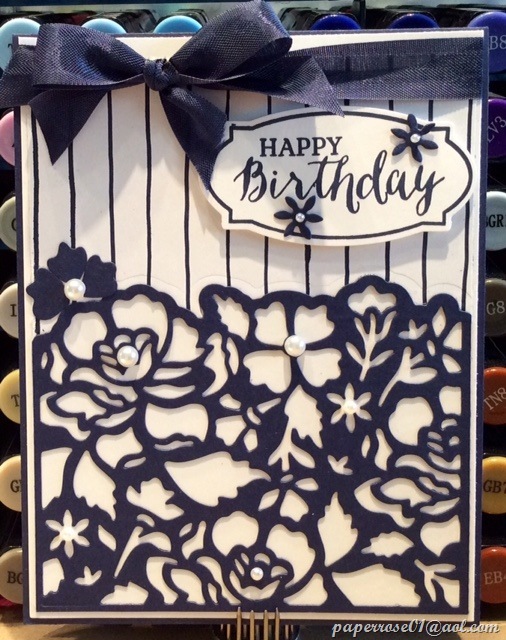 The 2 little flowers you see on the birthday sentiment came from the thinlit scrap and provide a perfect embellishment, especially with the 2 little pearls. I also use the scrap pieces when I discover an “whoops” on my card stock – a spot of ink, a blemish, or perhaps a small tear. 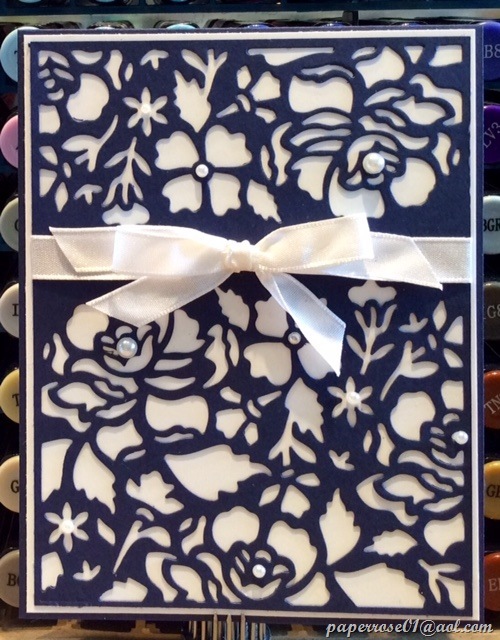 For the sentiment layer, I chose to use the smaller Floral Boutique thinlit die on white cs allowing the Night of Navy to peek through in the negative spaces. This provides a perfect contrast to the top layer. I actually did 6 views of this card – 3 using the 2 thinlits as shown in the first view, and above and3 using the larger thinlit with the Floral Boutique Designer Series Paper. Although I chose to use the casual striped DSP, there are other patterns in the Floral Boutique package you can choose from. The view above shows a very elegant but casual card. You can choose your own style at September Stamp Camp! Hope to see you there this week – September 1, 2 and 3.